Hey Zack Synder, you brought the Spartans to Hollywood with 300 and helped create one of the best opening credit scenes in movie history with Watchmen. Now what'cha gonna' do?" "Dan - I'm gonna' direct the next Superman!" Yip, you heard right - Hollywood Reporter has all the signage details, but before you jump you might get a kick outta knowing with the trinity now locked in place (Snyder - director, Christopher Nolan - producer, David S. Goyer - screenwriter) today's announcement also revealed Zod will once again return to shake the big screen. 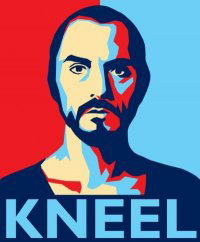 And, if common sense is involved, utter Terence Stamp's immortal one-word line 'Kneel'. Superman II is to me the ultimate non-comic Superman appearance, only closely outdoing the classic Fleischer cartoons of yore, so I naturally have the reaction to yell 'Danger Will Robinson! Danger!' whenever anyone attempts to tread on such hollowed ground. Still, if any team can avert potential career suicide from behind the camera, it's this one. What do you reckon? this is so rad!!! where do you find this stuff Dan!? an alternate one that says "ZOD" would be cool too. Glad you liked it David! I wish I could credit the artist, but it's posted on a whole site dedicated to Obama poster imitations. I'm looking at running a post on it one Sunday soon in making a mark so look out for more!